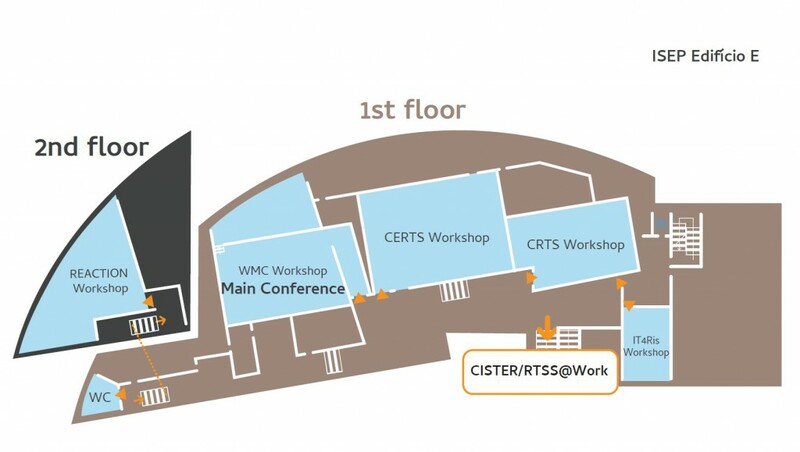 The RTSS 2016 conference will take place in the ISEP Campus, that is nearby FEUP Campus. 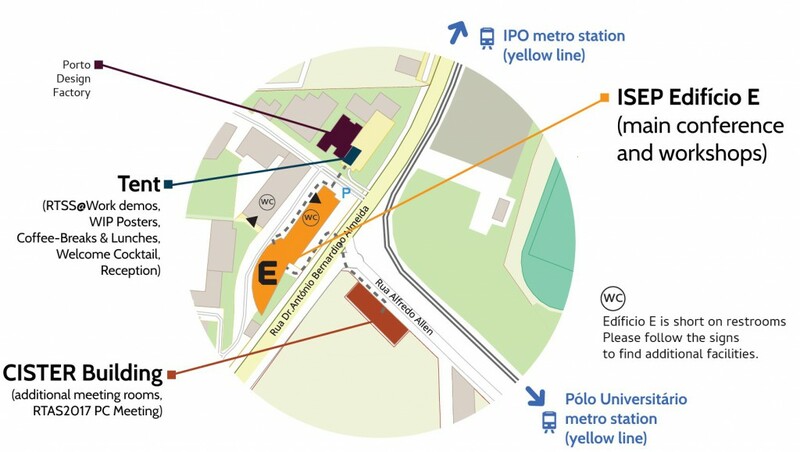 ISEP and FEUP are located in the University area in the north of the city, and are served by the Metro line D (Yellow Line,”IPO” station, or the alternative “Pólo Universitário”) with a direct connection (15 minutes) to the city center/downtown. If you have any questions about Venue and Hotels please contact Inês Almeida (infaa@isep.ipp.pt). Hotel IBIS São João is very good for an IBIS. WiFi is available in all areas and is free of charge. The rate for a double room for 1 or 2 persons is around 70 EUR/night (all taxes and breakfast included). Hotel Eurostars Oporto is an affordable 4 star hotel. The rate for a single room is around 85 EUR/night and 95 EUR/night for a double room (all taxes and breakfast included). WiFi is available in all areas and is free of charge. Quality Inn Praça da Batalha – Porto is a standard 3 star hotel. This hotel is located at a 5-minute walk from São Bento metro station. Rates are around 65 EUR/night for a single room and 70 EUR/night for a double (all taxes and breakfast included). WiFi is available in all areas and is free of charge. Ibis Porto Centro is a standard downtown Ibis. WiFi is available in all areas and is free of charge. This hotel is located at a 5-minute walk from Bolhão metro station. Rates are around 60 EUR/night for a double room (all taxes and breakfast included). Grande Hotel Porto is a charming 3-star hotel which maintains a dramatic, nineteenth-century, fin de siècle charm. WiFi is available in all areas and is free of charge. This hotel is located at a 5-minute walk from São Bento metro station. Rates are around 95EUR/night for a double room (all taxes and breakfast included). Hotel Porto Trindade is a 4-star hotel located right in the traditional center of Porto, with easy access to the main tourist attractions of the city and just across the street of Trindade’s metro station. WiFi is available in all areas and is free of charge. Rates are around 100 EUR/night for a twin room for single use, and 105 EUR/night for a twin room for 2 persons (all taxes and breakfast included). Eurostars Porto Douro is a 4 star hotel facing the Douro River and located at a distance of a 15-minute walk from the São Bento metro station. WiFi is available in all areas and is free of charge. Rates are around 95 EUR/night for a single room and 105 EUR/night for a double room (all taxes and breakfast included). Hotel da Música is a design 4 star hotel and only 400 m from Casa da Música metro station. WiFi is available in all areas and is free of charge. Rates are around 90 EUR/night for a single room and 100 EUR/night for a double room (all taxes and breakfast included). Moov Porto Centro is set in a refurbished Art Deco cinema and only 400 m from the nearest metro station – São Bento. The rate for a double room for 1 or 2 persons is around 50 EUR/night (all taxes and breakfast included). WiFi is available in all areas and is free of charge. The Star Inn is a low-cost design hotel with single rooms starting 40 EUR per night, all taxes included, no breakfast, 1 person per room. The hotel is located at a walking distance from the conference location (25 minutes). The Sheraton Porto Hotel & Spa features spacious rooms and a modern spa. The design guest rooms are decorated with a mix of wood, steel and glass furnishings. This hotel is only a 10 minute taxi drive from the campus. The rates are 179 EUR/night for a double room, all taxes and breakfast included. WiFi is available in all areas and is free of charge. Porto Palácio Congress Hotel & Spa combines executive-conscious and luxury rooms with top-notch spa and gastronomic treats. This hotel is only a 10 minute taxi drive from the campus. WiFi is available in all areas and is free of charge. The rates are 117 EUR/night for an executive single room and 132 EUR/night for an executive double room (all taxes and breakfast included). Intercontinental Porto Palácio das Cardosas is set in a renovated 18th-century palace offering spacious rooms with views to Porto’s historic center. This hotel is less than a 2-minute walk from São Bento Metro Station. WiFi is available in all areas and is free of charge. Please contact icporto.reservations@ihg.com and state code RTSS’16. They will offer a 10% discount on their Best Flex rate. The Yeatman Hotel is a design luxury hotel in Gaia with focus on the port wine traditions of the city inviting the guest in the wine spa concept and a relaxing environment. The campus is 15 to 20 minutes by taxi. Rates are around 153 EUR/night for an executive single room, 180 EUR/night for an executive double room, 167 EUR/night for a superior single room, and 194 EUR/night for a superior double room with all taxes inclusive and free access to the swimming pools and gymnasium. Send this form to Mr. Tomás Gencsi –Tomas.Gencsi@TheYeatman.com.